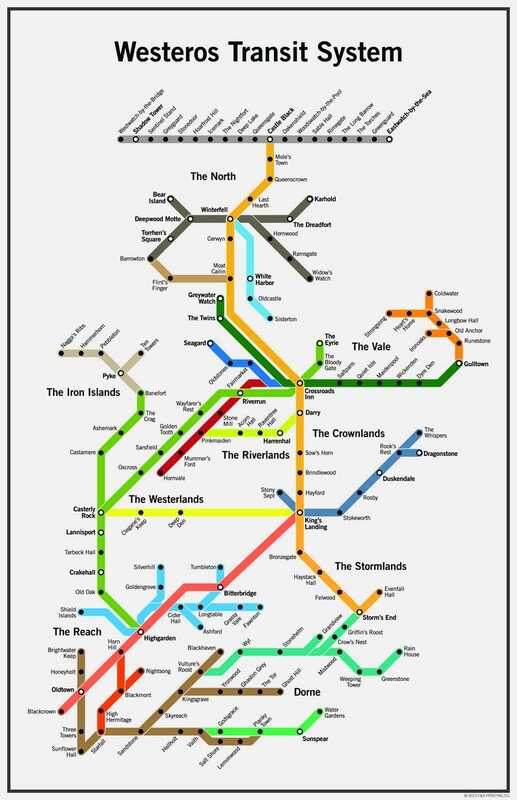 You'd think with all the war, assassinations, turmoil, political backstabbing, invasions from beyond the Wall, and everything else, that the Seven Kingdoms of Westeros wouldn't have had the time or the resources to craft quality public transportation for its people. But as this shockingly cool map proves, not so! It's the brainchild of the Brooklyn-based Etsy store Fencing & Archery, who have connected the cities, towns and villages of Westeros with this NYC-inspired subway map. I especially like how the North has apparently refused to allow the Iron Islands to connect with their main line in any way — good call, guys. Anyways, you can purchase an 11 x 17 print of this bad boy for $12, if you're so inclined (or are just planning a vacation there, I guess).